For a composer who dealt so extensively with themes of love throughout his oeuvre of operas, it would have been odd had love been something foreign in Richard Wagner’s own life. Indeed, Wagner’s love life appears to be a total drama in itself, involving two marriages and many episodes of infatuations. 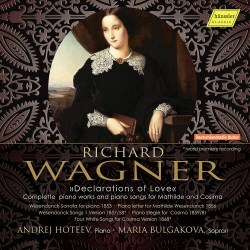 The current disc is a compilation of piano-based works in relation to two of Wagner’s most influential muses, Mathilde Wesendonck and his second wife Cosima Wagner. The Wesendonck Sonata is a work for solo piano dedicated to Mathilde Wesendonck, the wife of one of Wagner’s patrons and to whom Wagner was infatuated for a time in the 1850s. The two main themes, the A flat major first theme referring to Tannhäuser and the lyrical C major second theme predicting Eva’s song of praise in Die Meistersinger von Nürnberg, form a mirroring ABCBA form, with a central development section. While Wagner has certainly created more daring music than that of the development section, the two thematic materials are imbued with a deep sense of longing, brimming with echt-Wagnerian spirit. Compared to others, Hoteev is on the slower side of things, but is by no means languid. Themes unfold in naturalistic adoration, and while Hoteev allows himself some liberties in the use of rubati, all is done in view of the deep human affection underlying the score. This is a memorable and deeply felt performance. For the Wesendonck Lieder, a substantial work devoted to Mathilde during the peak of their affair-triggered mayhem, the current recording presents a world premiere based on the recently released 1857/58 original score edited by Elisabeth Schmierer (Laaber Verlag, 2013). While the general melodic structure of the work is essentially identical to that of the more commonly recorded version, the original score presents subtle differences in the piano accompaniment, especially of the introductions, e.g. ‘Schmerzen’ and ‘Sehen still’, and codas, e.g. ‘Engel’ and ‘Schmerzen’. Overall, the revised score feels further embellished and diversified in terms of texture. Beyond its historical significance, the relative sparseness and simplicity of the original score may be a source of fresh perspective. It is worth noting that in ‘Schmerzen’, soprano Bulgakova sings an alternative text in the section ‘auf leuchtendem Gefieder.’ Singing wise, compared to the operatic Jessye Norman and Irwin Gage, Bulgakova’s softer voice may lack depth and body especially in areas of soaring pitches, e.g. ‘Träume’. Having said this, Hoteev and Bulgakova’s less dramatic, more sober if not somber rendition is preferable to the rushed and oddly balanced, i.e. vocal-focused, account by Michela Sburlati and Marco Scolastra. Wagner being essentially an operatic composer, the orchestral arrangement of the songs may befit the covert operatic impulses breathing underneath the score. Not surprisingly, the orchestral edition has been more popular and accepted than that of the piano-voice format, historically. Nevertheless, the piano and voice combination blends intimacy with a special breed of softness, something that Wagner would have sympathized with during the composition of these songs. The Vier weiße Lieder, on the other hand, was written in the context of Wagner’s love affair with Cosima, then still officially the wife of the pianist and conductor Hans von Bülow but who would eventually become the second wife of Wagner. A birthday present for their latest child, Siegfried, the four-song cycle is in fact a reworking of Wagner’s earlier songs originally published in 1838/39. Based on an accidental discovery made during his research of Tchaikovsky’s Hungarian Gypsy Melodies for Piano and Orchestra at the Pierpont Morgan Library in New York, Andreij Hoteev – the pianist of the current recording – presents his edited version of the never previously recorded 1868 score of the work (Doblinger Verlag, 2017). This new edition presents a number of alternations relating to dynamics, tempo, and rhythmic details, especially in ‘Dors mon Enfant’ and ‘Mignonne.’ The changes are subtle, and overall there seems to be a tendency of simplification of the accompanying piano part. According to Hoteev, one can gather that these reconsiderations reflect not only the wealth of musical experience Wagner accrued over the thirty-odd years that separate the initial conceptualization and revision of these songs, but also the musical possibilities he had in mind for future operatic creations. For example, elements of ‘Tannenbaum’ are characteristic of the Norn motifs of Götterdämmerung, a work Wagner would start working seriously on from 1869. Regardless of the edition, Vier weiße Lieder is scarce on recording. Compared to Michela Sburlati and Marco Scolastra, Hoteev and Bulgakova are substantially broader, thereby somewhat reducing the degree of springy jollity associated with a birth of a child. Whether this tempo is something Wagner specified in the revision, I cannot say. If there is a real problem, however, it is in Bulgakova’s pronunciation of French, where at times the words become difficult to discern from each other, e.g. Attente. This, I am sure, is not what Wagner would have intended in his revision. A number of works in the current disc have direct relationships with Tristan und Isolde. The piano parts of ‘Träume’ and ‘Im Treibhause!’ from the Wesendonck Lieder, for instance, are studies of Acts II and III of Tristan und Isolde respectively. In Schlaflos, written three years after the composition of the Wesendonck Sonata, a number of melodic possibilities of the love duet in Act II of the opera are outlined. Schmachtend, too, is tinged with a Tristan sort of yearning. Fittingly, the title of this work, meaning ‘languished’ and ‘soulfully’, is the performance direction of the prelude to Tristan und Isolde. Here, Hoteev plays with the care and feeling. Overall, one can have a glimpse of Wagner in an intimate mood. Apart from a small number of setbacks, the performances are satisfying, with the Wesendonck Sonata being exemplary. Given that two of the five pieces are world premieres, this is a disc that would interest numerous Wagnerians, therefore.